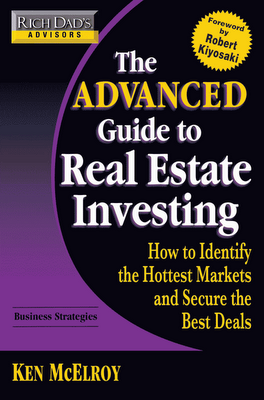 The book of the week was The Advanced Guide to Real Estate Investing by Ken McElroy. I think I may have a slight obsession toward real estate books because no matter how many times I read them, I never get bored and I always pick up another tip or remind myself of one I may have forgotten. And... McElroy is one of my favorite authors on the subject. He gives it to the readers straight and concise. I appreciate a person that doesn't need to add a lot of fluff to their writings. "I know that after reading this book I could make six figures in the business of real estate investing in 5 years or less. The first step is exactly that: Making a goal for yourself. Tell yourself that you want to make more than $100,000 annually in 5 years in multi-unit real estate investing. The goal you set for yourself has to measurable- "over $100,000", Time based- "5 years", and specific- "multi-unit real estate investing." And now that you have your goal, it is time to hit the ground running. You will need to find a team because great things are seldom done alone. You will want a lawyer, accountant, engineer, etc. People that you can turn to and ask questions when they arise during your research. Another great thing about having a team to help you with your real estate dreams is you have people to keep you accountable. If you have ever worked out.. weight-lifting, running, or biking. You know it is so much easier to succeed when you have a partner to help you through. You will then have to go out and find your ideal real estate. McElroy line-items just about everything you will need to look for when you are researching. This can be a fun time. Once you find the right property for you, this book will tell you how to find the "right" asking price. In the book there are detailed guides to writing your letter of intent to your buyer and how to go through the final process of acquiring your property. After you have your property you will need to decide if you are going to be the property manager- the person that handles the landlord duties- or are you going to outsource that job to property management company. I recommend outsourcing for any property over 8 units. Let someone else handle the rent checks, leaks, broken appliances, flooding, evictions, background checks, criminal checks and the list goes on. Outsourcing this job will allow you to work on researching other properties or continuing career goals. Property management companies will charge between 8% and 14% depending on the number of units and the company. However, remember that like all things, you get what you pay for. As you venture into this new world of Real Estate Investing you may start small with a duplex or a small apartment complex. If you follow the guidelines laid out in this book you will have a steady cash flow to reinvest in new larger properties. The goal that I previously outlined in this review is not far-fetched. If you are motivated, put the excuses aside, believe in yourself, and really go for it you can reach this goal. In the current economy you have a goldmine of opportunity. Go do some research and put yourself out there. Interest rates are low and everybody is selling. It's a buyer's market, so take advantage!" You can see how much the original book got me psyched up. This one got me pretty excited too. I know that when I start to lose a little bit of fire, I can read a Rich Dad series book and get myself refocused and back on track mentally. And trust me, it's needed sometimes. When you start to think big and do big things, you will have everyone tell you that you shouldn't try and you need people around you to encourage you... even if some of those people are authors with words inside a book. In the Advanced Guide, McElroy is thinking even bigger. He writes about multi-family investing on a very large scale. The buildings talked about in this book range from 100-400 units. That is very large, especially if you haven't done any real estate investing yet. However, I think that large apartment complexes are the right way to go after you get your feet wet. When you have large apartment complexes you will most likely purchase the place with an on-site management company. This is a huge perk because it allows very close management of the property. If you have a ton of duplexes you don't have the luxury of on-site management, meaning bad tenants (heaven forbid you end up with very many) can get away with more bad things. Additionally, the purchasing power you can muster when you buy a large apartment complex can be staggering. Investors are more likely to invest one big lump sum instead of the same amount invested over 50 different duplexes at different times. Besides the amount of time you would be consuming to get 50 different meeting times with managers to show them due diligence on each property. You would have to somehow find the time to do due diligence on 50 difference duplexes. It just makes more sense in terms of efficiency to consolidate your efforts into one sure-fire investment. I do think that if you are planning to do a big project like the ones outlined in this book that you need to first start small. This is what I call getting your feet wet. Go ahead and save a sizable amount of money for a down-payment. Depending on where you live anywhere from $5-15k will work. Then find some nice duplexes or fourplexes, do your due diligence on each property and work with your team to determine whether it is a good investment and then go for it. The most difficult thing for people during all of this is taking the "risk." Well, if all the numbers work out and your team feels good about it. The "risk" is probably much more minimal than you think. I encourage you all to get your feet wet and go for it... You will be taking one big step toward financial freedom and the ability to live the lifestyle you desire. I think this book was a great sequel and I encourage you to pick it up and give it a read if you have the courage to give it a try. Again, McElroy is a great author and I have loved every book I have read by him and I think you will feel the same. As always, if you have any questions on the book don't hesitate to ask. I would be more than happy to help anyone that wants it. I think that book is a great guide for real estate investing. I should definitely read it sometime. I don't really depend on what I read in the internet, especially when it comes to real estate investing, but that book caught my attention. I think it will give me tons of ideas and tips about real estate. Really looking forward to our new property managers. These people are worth mentioning. They appeared for showings on time and were always professional.